Click on the devices below to see how the web content built with RadPageLayout will look like. 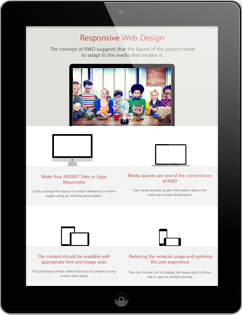 Resize the window to see in action the responsive capabilities of the control. The Page Layout allows you to quickly build your page layout on server-side. Using the control, you can add responsive capabilities to your sites and apps and ensure that their layouts will fit properly on either desktop or mobile devices. The control is also light-weight and could help you reduce the bandwidth of your sites and apps. You can examine the Responsive Web Design sample application for more information on how to build responsive web sites using the responsive and adaptive capabilities of Telerik UI for ASP.NET AJAX. RadPageLayout and 90+ other controls are part of UI for ASP.NET AJAX, a comprehensive toolset taking care of the common functionality of your application, while leaving you with more time to work on its business logic. Click on the devices below to see how the web content built with RadPageLayout will look like. 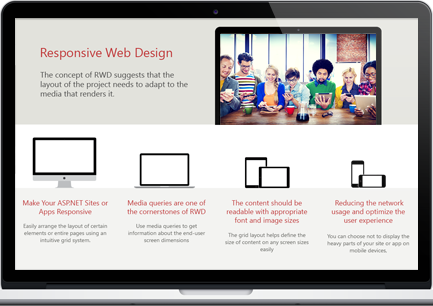 Resize the window to see in action the responsive capabilities of the control.